When you place a cone on the Earth and unwrap it, this results in a conic projection. Some of the popular conic projections Albers Equal Area Conic and the Lambert Conformal Conic projections. 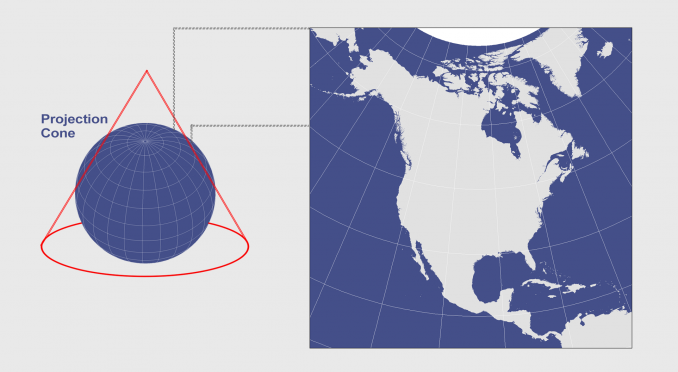 Both of these types of map projections are well-suited for mapping long east-west regions because distortion is constant along common parallels. But they aren’t terribly good at projecting the whole planet. 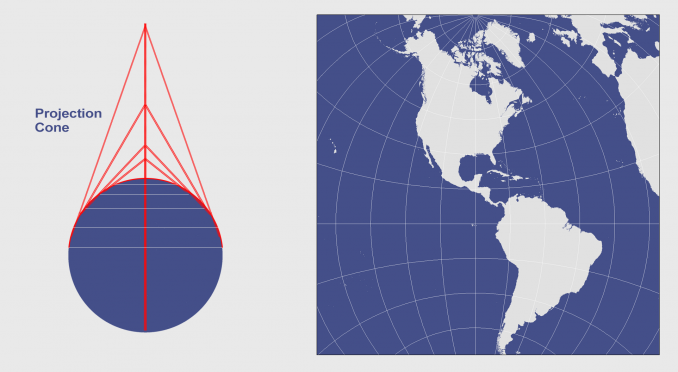 Here are some details on conic projections and how maps use them today. The Albers Equal Area Conic projection is commonly used for displaying large countries that require equal-area representation. For example, the USGS uses this conic projection for maps showing the conterminous United States (48 states). H. C. Albers introduced this map projection in 1805 with two standard parallels (secant). As the name states, the purpose was to project all areas in the map proportionally to all areas on Earth. Like all projections, the Albers Equal Area Conic Projection has map distortion. Distances and scale are true only on both standard parallels with directions being reasonably accurate. Areas are equal to the same areas on Earth, though it’s not conformal, perspective, or equidistant. The Lambert Conformal Conic is one of the many creations by Lambert in 1772 still widely used in the United States today. It looks like the Albers Equal Area Conic, but graticule spacings differ so that it’s conformal rather than equal area. It uses a conic developable surface secant at two standard parallels, usually at 33° and 45° to minimize distortion. However, standard parallels vary depending on location. For example, Canada’s standard parallels are usually 49ºN. and 77ºN. Furthermore, the State Plane Coordinate System (SPCS) uses LCC when zones have an east-west orientation. The major advantage of the Lambert Conformal Conic map projection is how it retains conformality. Despite how distances are reasonable accurate and retained along standard parallels, it isn’t equal-area as distortion increases away from standard parallels. This now obsolete map projection uses an infinite number of cones tangent to an infinite number of parallels. This type of protection is generally used for countries that span along longitudinal extent. In a polyconic projection, all meridians except the central one have curved lines. Only along the central meridian, distances, direction, shape and areas are true. However, distortion increases away from its central meridian. Overall, this map projection compromises many properties. It is neither conformal, perspective, or equal area. 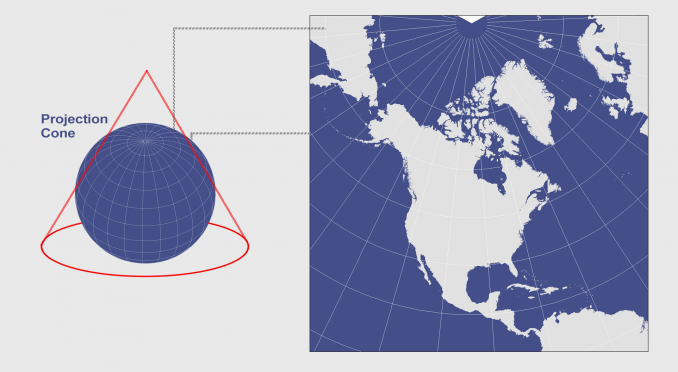 Unlike cylindrical maps, conic map projections are generally not well-suited for mapping very large areas. They are more suitable for mapping continental and regional areas. For example, Albers Equal Area Conic and LCC are common for mapping the United States. Polar orientation conic projections has its cone center point directly above the pole. Meridians are straight converging at the pole. Parallels are arcs circling around the pole. Parallels cross meridians at right angles. Tangent cones result in one standard line where scale on that line has no distortion. Secant cones cut distortion down with two standard lines. These standard lines have no distortion but it increases away from these lines. What is GIScience (Geographic Information Science)? For ArcGIS projections, define projection changes the metadata describing the current projection. The project tool changes the projected coordinate system. The State Plane Coordinate System divides the United States into 124 zones to locate any point with a high level of accuracy (one part in 10,000).